Kurdistan Government opened the first Armenian Apostolic church in capital city Erbil. The Armenian church was a project of Kurdistan since last years and it has been built and supervised by government. 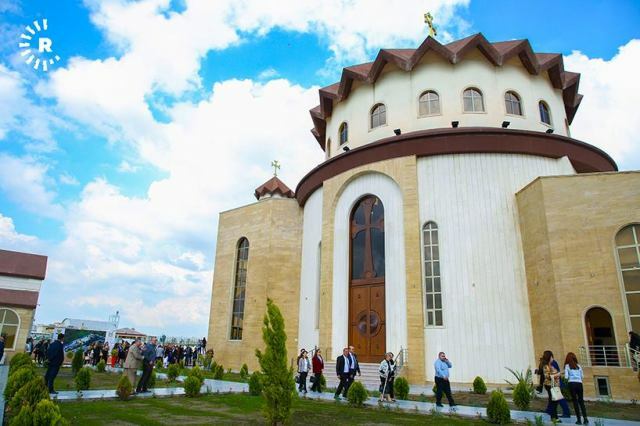 Brussels, 7 April 2019 - Middle East Diplomatic - The Kurdistan Regional Government opened the first Armenian Apostolic church in capital city Erbil. The Armenian church was a project of Kurdistan government since last years and it has been built and supervised by the Ministry of Kurdistan for Endowment and Religious Affairs. There are four more Armenian churches in Kurdistan region located other cities provides religious services for around 600 Armenian families. The first Armenian Apostolic church in Erbil located in the Christian district of Ankawa, an area known for having a predominantly Christian population, mostly Assyrian / Keldanian. In a special ceremony attended by Kurdistan governmental officials and foreign envoys, the house of prayer was initiated. Mr Dizayee stated that the culture of tolerance and coexistence is not a political decision, but it rather has deep cultural roots in Kurdistan. He also said he hoped that displaced Christians could return to their homes in the Kurdistan Region and areas with diverse populations outside Mosul known as the Nineveh Plains. The Kurdistan Region is home for over 120,000 Christians, distributed throughout the different provinces but with the majority living in Erbil and Duhok. Following the emergence of the Islamic State in Iraq in 2014, most were displaced to areas administered by the KRG, while others fled abroad. There are around tw millions refuge living in Kurdistan region including about halve million Christians.